The Transportation Security Administration (TSA) continues to expand its duties and places it operates. AAI has been very critical of the TSA’s SPOT program—which profiles travelers based on a “perceived threat, which has given rise to racial profiling allegations in Newark, Honolulu, and Boston. Furthermore, a recent report from the Government Accountability Office suggested a 26% spike in misconduct by TSA in recent years, begging further oversight and investigation; however, systems in place for oversight are hardly tenable, and with increased funding, the TSA has begun to further overstep its original charter. While the mission of securing the relative safety and security enjoyed by US citizens is an important pursuit, it’s hard to justify the TSA’s ineffective policies, unaccountable enforcement, and ever-increasing budget. While most civil liberties groups have focused on TSA abuses in airports, many don’t recognize the extent of the TSA’s reach. As a response to the 2004 Madrid train bombings, the TSA developed the “Visible Intermodal Prevention and Response” program—called VIPR—to increase their presence in all manner of transportation hubs. The program has been around for a few years but it’s receiving more attention recently as the Administration has increased annual funding for the program—currently at about $100 million. If you live in a major metropolitan area (like a majority of Arab Americans), it’s entirely likely you’ve seen one of these VIPR teams. 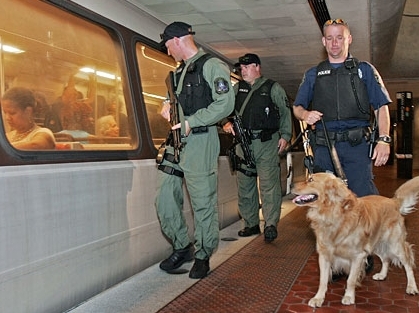 These teams are deployed at transit hubs in order to demonstrate a security presence and perform security stops and searches and have largely worked in concert with local law enforcement in order to conduct their operations. CNN reported upwards of 4,000 of these operations in 2010 alone. VIPR expands questionable TSA policies beyond airports and into all kinds of public spaces. While the TSA’s mandate originally called for the agency to protect our airports, it’s also understandable to see them working in other areas of mass transportation; however, it’s more difficult to understand why they are also operating at rodeos, music festivals, and sporting events. In so doing, the VIPR program expands TSA’s reach to places and situations which are traditionally under the purview of local law enforcement. These VIPR teams are also implementing SPOT profiling techniques in their operations. Indeed, much of the praise VIPR gets is from security officials from Ben-Gurion airport who have already instituted profiling as a means of “security”. They’re essentially unannounced and random showings of force trying to deter or foil terror plots, yet unaccountable to anyone. This program, which is costing tax-payers $100 million annually, has no proven record of success and institutes policies that violate the 4th and 14th Amendments. VIPR auditors have suggested that these teams lack “the skills and information to perform successfully in the mass transit environment.” How can the TSA justify not only the fiscal expense, but also the incursion on civil liberties without substantial quantitative support for this program?